PSV 2001 Range: 3.0 oct (F3-F6). Bars: Satin Silver Finish Alloy. Alloy Bar Sizes: 45x12. Pitch: A=442. Motor: Control Speed 25-150 RPM. Frame: Standard. Height Adjustment. Resonators: Clamp System. Height: 81 - 111.5 cm. Casters: Large with brakes. Performing Standard 2000 Series. 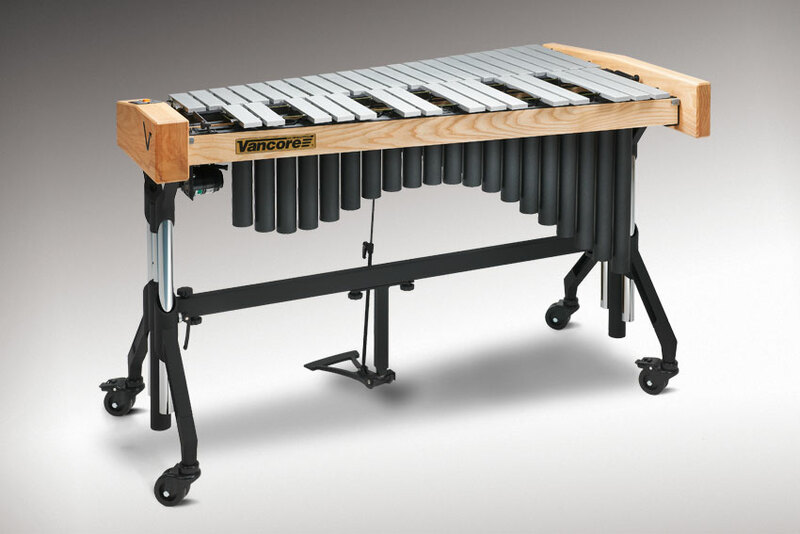 The Vancore 2000 series vibraphone provides professional sound and performance at a budget price. Features include three octaves carefully tuned satin silver finished bars. The instrument is height adjustable and extremely easy to transport. Supplied with a variable speed motor and build in control unit. The Performing Series Vibraphones are also available in the 1000 Series. A complete series of mallets instruments designed for the budget minded students, orchestras and ensembles. These instruments feature the same select bar materials and carefully handcrafted resonators which are used for the Custom Series. The frames of these instruments are produced using European Ash wood. The height adjustment on these models can be executed very easily! Dampening System Integrated Speed Control. The speed control unit is integrated into the smallest end piece. This feature guarantees an easy speed control body movement and on top of that it avoids damage during transport of the vibes. Floating Bar Suspension. Most notable is the new Floating Bar Suspension System (FBS). This proprietary bar support system actually increases bar resonance by 20%! Precision laser cut bar support arms are angled to insure that each and every bar is supported exactly to the nodal point.